Continuous deep bed filtration with sand bed heights between 1 and 2 meter fulfils the high requirements on effluent quality. In combination with a physical/chemical treatment stage (precipitation/flocculation) also dissolved material (e.g. orthophosphate) iscarried over into the solid phase and separated in the filter. Colloidal material is agglomerated to filterable material is flocculated to filterable material. Measurements have shown that the CONTIFLOW® significantly reduces the number of germs. In case of increased disinfection requirements, installation of a subsequent UV disinfection unit is possible due to the low concentration of solids in the filtrate. The system is available as a steel tank design or concrete basin design for large flow applications. The concrete basin design consists of several modules. Their number can be tailored individually to particular flow and process requirements – up to 12 modules. The rough surface of the grit paricles allows the growth of biomass. The nutrients contained in the inflow, such as nitrogen, are eliminated through biological degradation. Iron/manganese can be carried over into the solid phase by preceding oxidation and separated by filtration. Elimination of nitrogen and degradation of organic substances is achieved by means of the biologically intensified filtration. The Sandfilter is also used as a reactor for nutrient reduction with chemical phosphorus elimination through precipitation. Precipitants and flocculants, such as iron or aluminium salts, can be dosed directly into the filter inflow. Due to the reduced precipitant consumption the economic efficiency of chemical phosphorus elimination in the Sandfilter is higher than the economic efficiency of conventional simultaneous precipitation. Feed is introduced at the top of the filter and flows downward through an opening between the feed pipe and airlift housing. As the influent flows upward through the moving sand bed, the solids are retained in the filter sand. The filtrate exits over a weir at the top of the filter. 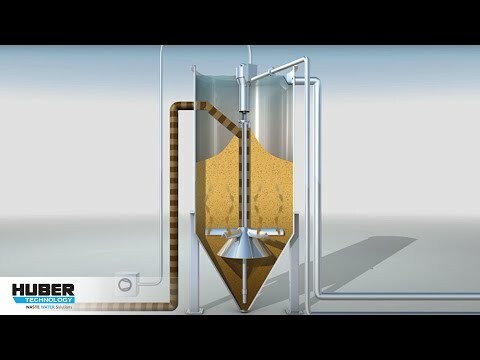 The sand and the filterable solids are transported through the airlift into the washer in the upper filter section where the solids are separated from the sand. As the sand falls through the washer, a small amount of filtered water passes upward, washing away the dirt, while allowing the heavier, coarser sand to fall through the bed. The wash water, which consists in a certain amount of filtrate water and separated solids, exits near the top of the filter.